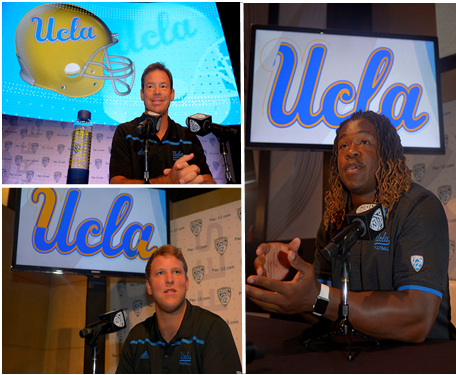 Here are some more scenes from UCLA’s time at Pac-12 Media Days. 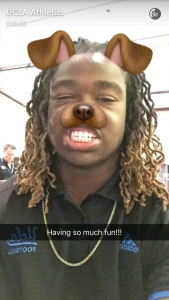 Katie Richcreek and I recapped UCLA’s Pac-12 Media Day session on Facebook Live on Friday. 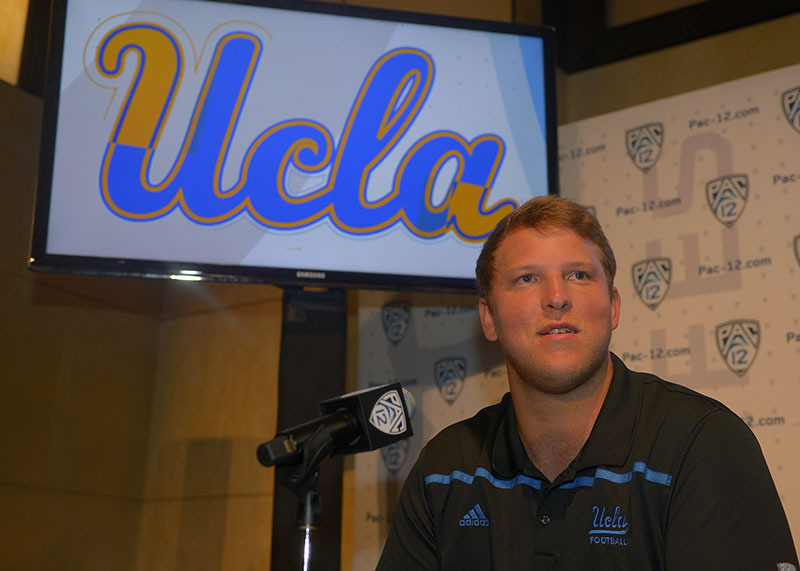 We talked about the big UCLA news from the day: Tom Bradley, Josh Rosen and new uniforms. 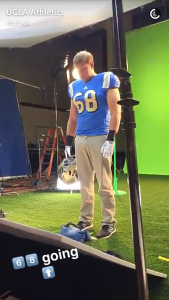 Along with a new blue home jersey, the UCLA football team will have an alternate navy blue uniform, head coach Jim Mora said Friday at Pac-12 Media Day. Mora worked with Adidas to redesign the primary home look due to recent complaints. The jersey was released on Twitter earlier this summer. The head coach said representing the alumni and the university “the way they want to be represented” is important to him, so he softened the blue color on the home jersey, changed the shine on the pants and extended the shoulder stripe. Mora said the alternate uniform will be the same structure as the primary jersey, but with possibly a different font for the numbers and a different color. The jersey will be navy blue and the players will wear blue pants, Mora said. 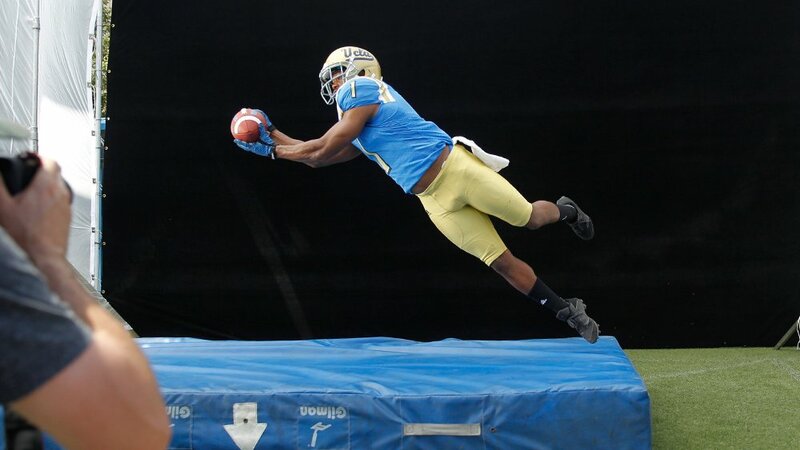 Click the above photo (or HERE) to see photos of UCLA and other Pac-12 teams during Day 2 of Pac-12 Media Days. 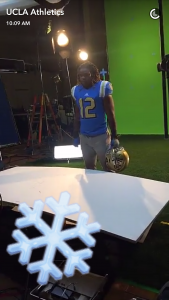 Above clockwise from top left: Head coach Jim Mora, linebacker Jayon Brown, offensive tackle Conor McDermott. Photos from John McCoy/Southern California News Group.